Hurricanes are horribly fascinating in my mind (maybe too fascinating, as anyone who followed this blog prior to and following Katrina will probably attest). They're right up there with tornadoes and freak blizzards on my list of favorite meteorological events. And even though each of those things devastates property and can rack up a priceless loss in human life, hurricanes are a whole 'nother thing psychologically. I can't put it any other way than this: To be in the path of an oncoming hurricane is like looking down the barrel of God's shotgun. 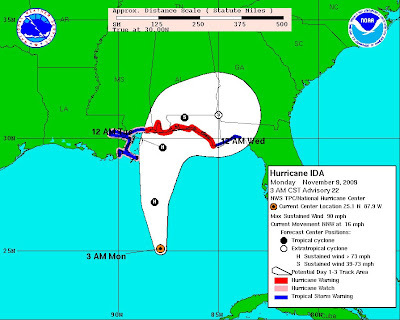 Hopefully the Gulf waters will have cooled off this time of year and take a lot of the strength out of it before Ida makes landfall. On another note, the current track looks to bring some still much-needed rain to this part of North Carolina later in the week.